In my 25-plus years as an executive recruiter, for nonprofit and for-profit organizations alike, I’ve heard these words — or words very much like them — more times than I care to remember. All too often, the “perfect” candidate turns out to be a far-from-perfect employee, and sometimes even a perfect nightmare. When that happens, the organization is likely to be faced with the extremely unpleasant task of terminating the employee, and then going through the difficult, disruptive — and expensive — recruitment process all over again. And while all that’s going on, the organization’s mission is certain to suffer. There are plenty of reasons why the “perfect” candidate doesn’t work out. But in my experience, it’s usually because one absolutely critical factor was overlooked in the hiring process: how well the candidate’s values align with those of the hiring organization. And this is especially true of the nonprofit sector, where, let’s face it, values are everything. In the private sector, the pursuit of profit can be seen as the only organizational value that matters. (I have my doubts about that, but that’s a subject for another time.) But things are inevitably more complicated in the nonprofit world, where people come together not simply to make money, but to make the world a better place. And they have very strong ideas about how to do that. That’s why a candidate who doesn’t share your organization’s values — recognizing the importance of its unique mission, and understanding and accepting its established organizational culture — will never turn into the high-value employee the organization needs. And that’s true at every level, from the executive director and senior managers to operational personnel working in the field. So how can you make sure that “perfect” candidate not only has the right qualifications, but also the right set of values? It isn’t easy, because every nonprofit has its own unique mission and organizational culture and its own associated values, but it can be done. And it will really pay off, in terms of increased efficiency, reduced employee turnover, and better execution against your organization’s vision. Work to understand your own organizational culture. If you take a moment to think about it, you’ll realize that most of us are just too busy performing our day-to-day functions to give much thought to how we do them, and why, and why it matters. But it’s crucial that we figure it out. It obviously isn’t just about money — most people who work for nonprofits could make a lot more in the private sector — but it also isn’t just about the mission. Another central element is how we go about performing the mission. Most people in nonprofit organizations care about people, for example, and that means they tend to place a high value on face-to-face, human-to-human collaboration. If that’s true of your nonprofit, you obviously need to look for candidates who feel the same way — people who are willing to come into the office every day, develop meaningful professional and personal relationships, and work with many different kinds of people. Someone who’s used to working remotely from home, and expects to communicate mostly through email or instant messaging or Skype — and perhaps not collaborate at all, in any meaningful sense — simply isn’t going to be the right fit for your organization. So take some time to figure out how your own organization works, and what its unique cultural values are. That effort, which should involve a broad range of people across the organization, not just a human resources person and the hiring manager, will give you a much better idea of the sort of candidate you should be looking for. Make sure any candidates on your shortlist understand your organization’s culture and values. It’s obviously in your organization’s best interest to offer any serious candidate a clear understanding of the sort of environment he or she will be expected to work in — and it’s in the candidate’s best interest, too. That’s why, when you’ve narrowed down a list of viable candidates, you should give each one an opportunity to meet with someone who can answer questions honestly and openly, helping the candidate to understand what the culture is like, what the organization’s strengths and weaknesses are, and how he or she can benefit — or not — from taking on the role. Sometimes the best person for this part of the recruitment process isn’t the hiring manager. Anyone who’s ever bought a house knows, for example, that allowing buyer and seller to communicate directly can cause misunderstandings and tension, and the same thing can happen when a candidate and the hiring manager discuss touchy subjects. Look for someone who’s recognized within the organization as having the ability to build relationships with people, in a genuine and open way, and give that person the freedom to answer any questions the candidate has, openly and honestly. 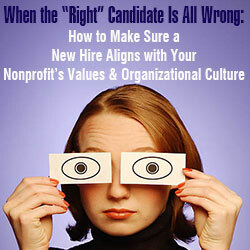 This will ensure that the candidate you end up hiring fully understands the organization, its mission and its values. It may also mean that some qualified but not-quite-right candidates will choose to walk away — and that’s just fine. Recognize that the “best” candidate isn’t necessarily the “right” candidate. Not all candidates are equal, of course. Some come with very specific skill sets that you may be looking for, some have stellar backgrounds in related but not identical fields, and some seem to have it all. That means you’re sometimes in the paradoxical position of having to choose from a set of candidates who could all potentially be great for the position you need to fill. So how do you decide? Well, it helps to remember that some qualities can be learned, or taught, but others simply can’t. It’s great, for example, to hire someone who already has operational skills that make up the day-to-day functions of the job. But in most cases, those skills can be learned on the job — especially if the candidate has parallel or comparable experience or competencies — but that’s not true of many of the less-tangible qualities I’ve been talking about, like interpersonal communication and collaboration skills and the willingness to adapt to your organizational culture. So when you’re evaluating candidates, it’s crucial that you heavily weight the qualities we’ve been talking about — and above all, the candidate’s alignment with your organization’s values. In the end, they may actually turn out to be far more important than the specific skills and experience the candidate brings to the role. About Trilogy Search Non+Profit: Trilogy Search Non+Profit is a retained executive recruitment firm headquartered in the San Francisco Bay Area. Trilogy specializes in placing executives who are multi-dimensional, integrated, and equipped to effectively lead for-profit and nonprofit institutions. The company conducts C-level searches and builds executive management teams for high technology, clean technology, life sciences, non-profit, and philanthropy clients. www.trilogysearch.com. At the helm of the Trilogy team is Chuck Pappalardo. An accomplished industry veteran, At the helm of the Trilogy team is Chuck Pappalardo. An accomplished industry veteran, Chuck brings more than 25 years of recruitment insight and experience to the executive search process. Specializing in C-level searches and building executive management teams for technology, clean technology, life sciences, non-profit and foundation clients, Chuck has worked with such organizations as Amgen Inc., CooperVision, EdSource, Education Sector, Humanity United/Omidyar Network, Ice-Energy Inc., inVentive Health, New Door Ventures, The William and Flora Hewlett Foundation, and Thermo Fisher Scientific Inc. Prior to founding Trilogy Search Non+Profit, he was a partner and managing director with Christian & Timbers, now CTPartners, in the Cleveland and San Francisco Bay Area offices. A respected leader in the retained search industry, Chuck has been quoted in the Silicon Valley/San Jose Business Journal, San Francisco Chronicle, Fast Company, Wall Street Journal, Workplace Management, Forbes.com, E-Commerce Times, CIO, Philanthropy Journal, and The Chronicle of Philanthropy, among other publications. He has also been interviewed on NPR. Chuck currently serves on the board of Book Trust, a nonprofit that provides underprivileged children with the opportunity to choose, own, and delight in books.